Through an video interview shooted in the Plant garden at the Muséum national d’Histoire naturelle (in Paris) and displayed within the exhibition on the thematic of the earthen architectures in the tamazgha, Berber speaking area. by contributing to the exhibition catalogue with a chapter on the Berber earthen architecture. See my contribution: Earthen architectures. The example of Siwa. 16/05/2008 - L’Abbaye de Daoulas consacre une exposition sur les mondes Berbères intitulée “Berbères de vie en rêves”. Press Release (in French) of the exhibition Berbères, de rives en rêves, Daoulas, May 15th 2008. This article has been read 1057 times. Dernière mise à jour de cette page le Monday 11 August 2008 à 13:45:11. //// -----> Citer cette page? 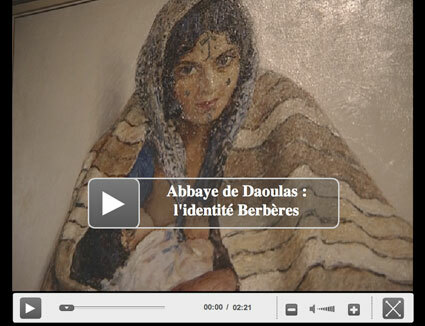 Vincent Battesti, "Exhibition “Berbères, de rives en rêves” (Berbers, from shores to dreams)" [en ligne], in vbat.org anthropoasis, page publiée le 17 May 2008 [visitée le 13 April 2019], disponible sur: http://vbat.org/spip.php?article454.